Leo Fender’s genius is twofold. He created extraordinary, enduring instruments which could be mass-produced without the need for the highly-qualified craftsmen previously needed to produce fine (electric) guitars. He also got it virtually completely right first time, not only with his first guitar, the Telecaster, but also with this, his second design. Introduced in 1954 to capitalise on and extend the success of the Telecaster (nee Broadcaster, then ‘nocaster’), the Fender Stratocaster is probably the most iconic, well-known and widely copied design. When it was introduced, its radical styling redolent of ‘50’s automobile design, its ‘comfort contouring’, its three pickups and its ‘synchronized tremolo system’ put it light years out in front of anything else on the market. Fine as it was, Gibson’s Les Paul suddenly looked like something your dad played, whilst endorsements from leading rock’n’rollers like Buddy Holly helped put it into the mind and the on the wishlist of every would-be teenage guitar hero. Even the recessed, slanted mounting socket for the jack is as inspired as it is functional. From ’54 to ’58, the ‘Strat’ has a maple neck, though the body material changed in ‘56 from Ash to Alder on all but the few transparent blonde examples. By ’59 it has a rosewood ‘slab’ fingerboard and the earlier thin single-ply scratchplate has become a thicker three-ply white/black/white. The chemical composition of the top white layer leads it to fade to a pale mint green over time and, the plastic comprising all three layers shrinks against the metal screening plate beneath, pulling the mounting screws off-true. Later, in ’63, the rosewood fingerboard was changed to a thick curved veneer and various other, regrettably typically retrograde, design changes followed the company’s change of ownership in the mid-‘60’s. Although earlier examples appeal to collectors for their relative rarity, ca.’57 and ’60-’62 Stratocasters are probably the finest examples of the instrument. The ’57’s materials, especially its one-piece maple neck make it lighter and brighter, whilst the later ’60-62 configuration has a slightly darker tone. Most Stratocasters were offered in sunburst finish, but a dozen or so custom colours, drawn from popular automotive finishes of the day, were also available at a ca.5% premium. 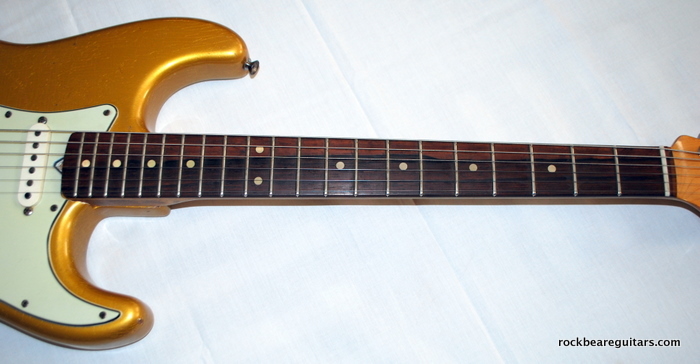 Some had gold-plated hardware and a few, matching-coloured headstock fascias. Necks were available in four different widths from the most common and narrowest (‘A’) to the widest, almost-classical (‘D’). At the time, popular taste was for the more playable thinner necks – remember, light string gauges were still to come – so they were and are more common. Pity, because just as the earliest Telecasters (the legendary ‘Blackguards’) and sunburst Les Pauls showed, thick necks sound really good. This example is a ‘A’ or’B’ but also has a very thick, round profile like Jeff Beck prefers (with good reason). It plays great and sounds fantastic – fat but also cuts right through a band’s mix. Neck date is Nov ‘61, body date Feb ‘62. Custom colours are variously much scarcer and Shoreline Gold is on the rare side of average. It’s seen some wear but is in very good shape compared to many, many contemporary ‘Strats I’ve seen and played. There’s very little lacquer left on the neck, but the rosewood slab board has a lovely skunk stripe in it. I bought it from a guy in South London for less than £200 in ’74. It’s as it was then, right down to the very slightly whiter neck pickup cover. The only mods I am aware of are those I am responsible for – the rewind I had to have done on the bridge pickup when it failed, and the rechroming of the original bridge saddles. It’s hard to believe Leo Fender could get it so right so early, and how so many others could get it so wrong so many times in subsequent years. Footnote : surfing the web just now, it seems that a company called PN Electronics in Hamilton Hill, Western Australia is using one of my pix of this guitar from an earlier incarnation of this site on its website. There’s no misrepresentation – it’s not trying to pass off something it doesn’t own as for sale – just a bit of light pilfering of my image. I suppose I should be flattered. Great pictures and a lot of interesting info too, maybe one day I’ll get my hands on one of these bad boys!